Synopsis, Our Opinion: An eccentric Hungarian white wine. 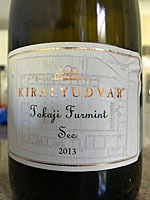 Grape Variety: Furmint blend – 85% Furmint and 15% Hárslevelu. 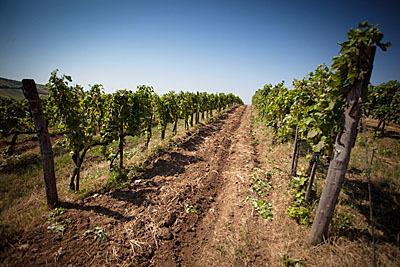 Geographic Appellation, Region, Country: Tokaj, Hungary. Paired With: Grilled vegetables and fresh from the oven rustic sourdough bread. Chilled before drinking. Slightly cloudy, dark oat straw color, but with an unusual polished copper color around the edges. VERY STRONG aromas of overripe apple with a little wet stone, lemon and sweet Confederate Jasmine (Trachelospermum jasminoides) blossoms. Fruity, off dry, medium body and a 150-grit texture. Brawny and dominant apple flavor with undertones of lemon and dusty turmeric. Abundant edgy acidity and a long and lingering finish of citrus and apple that extends with a lemon and mineral aftertaste. The combination of strong apple and citrus fruit plus the piercing acidity gave a delightful nuttiness to each sip. This was served chilled, but by the last pour it had warmed and the dominating ripe apple flavor began to be a little overwhelming. We called it an eccentric Hungarian white wine. Comments: Learn more about Királyudvar and their wines. Imported by: The Rare Wine Company; Brisbane, California.